I’ve strongly opined that Android devices do not need a security app to stay away from malware, but since controversy sells, vendors keep on developing bloated security apps and people keep on buying them. Still, if you’re the type who believes in using security apps, we respect you for your opinion and, as a matter of fact, have a new app for you to try out today. It’s called Appriva Mobile Security and you can check it out after the jump! Appriva Mobile Security Must Have App that will protect your phone from Malware, Viruses, Spyware, Trojans and all threats in real time. Appriva Mobile Security is Lightweight, has no signature updates, and consumes the least CPU and Saves Battery. 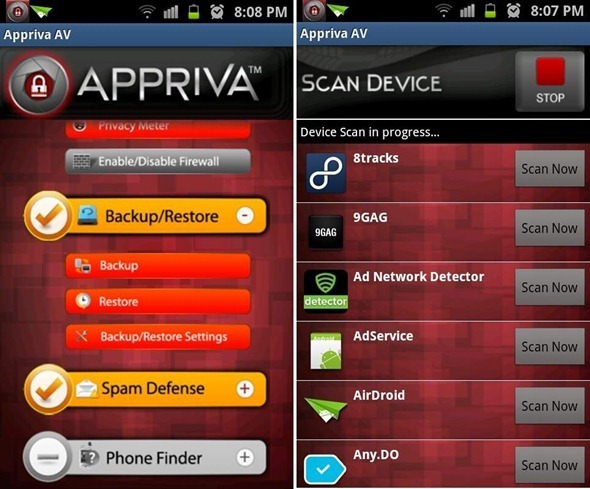 We’ve tested Appriva on a Samsung Galaxy S II (Android 2.3 Gingerbread) and can confirm that it works as advertised. Appriva comes with satisfactory user-interface (UI) and standard features like real-time protection, basic backup/restore of contacts,texts, pictures and apps, privacy protection, allow blocking of texts/call from numbers you can blacklist etc. etc. Appriva separates itself through its cloud antivirus feature wherein it compares data from scanned apps/files against signatures stored on its servers. This means you never have to update your local database of signatures and that the app consumes less better than conventional security apps. In conclusion: Appriva is no champ when it comes to offering a pleasing UI like Lookout, but it’ll get the job done especially if you’re looking for a performance-conscious security app. Don’t forget to let us know what you think of Appriva Mobile Security by leaving a comment over on our Facebook and Google+ page.